I am currently working with two social studies teachers to create a unit of study on the Holocaust. This collaborative unit will tap into the new 3C Framework for Social Studies Standards and the Common Core Learning Standards for Literacy to promote critical thinking, close reading and students creating their own multigenre text. This 6-8 week unit on World War II incorporates multigenre texts (book excerpts, poetry, plays, letters, primary documents, speeches, political cartoons, and additional art work), project based activities, and co-teaching among ELA and Social Studies teachers. Over the course of the unit students will write their own multigenre text as a formative assessment based on some aspect of World War II. This unit of study will be a skills based unit that requires students to look at aspects of humanity within war and conflict. Below are five learning stations that highlight the voices and testimony of Holocaust survivors and victims. What did you learn after reading this article? What happened to Anne Frank after she was taken out of the secret annex? How were their stories similar or different from Erma’s? Would you have done the same things they did if you were in their position(s)? 1. Read excerpts from diaries, written by teenagers, about their life in the ghettos, and their physical and emotional conditions there. The story of Yitskhok Rudashevski from Vilna Ghetto began writing his diary when he approached his fifteenth birthday. He wrote about his academic pursuits and of how he sees himself contributing to the intellectual and literary life of the Ghetto. On September 1943, the liquidation of the ghetto began. He and his family went into hiding; later on, the family was found and taken to Ponar, where they were shot to death. His friend, who survived, returned to the hiding place where she discovered the diary. 2. Complete the Think Dots Activity: Each person at your table will take turns rolling the dice and complete the learning task from the corresponding dot. What are some words in the poem that brings images to your mind? What do you think is the theme (message) of the poem? What line or lines from the poem gave you that indication? Emotional- Does the poet wants the reader to become emotional about the message? (angry, sad, happy, peaceful, complacent, courage, fear, etc.) What is your evidence?- Share a line. Reflective: Think about the message in terms of your own life, be inspired. Share a line and make a connection. And when I remember my old home so dear, I can love it more than I did, somehow. Here the weak die easy as feather And when they die, they die forever. But maybe I’ll be going there soon again. A place of evil and of fear. There’s little to eat and much to want, Where bit by bit, it’s horror to live. But no one must give up! The world turns and times change. Yet we all hope the time will come When we’ll go home again. What does the text mean? What is the artist’s purpose in taking this photo? Who did Samual Bak hope would see his artwork? Why? When a child is born, it has no prejudices. Has to model the behavior. Read aloud in your group Eve Bunting’s picture book Terrible Things. Discuss with your small group your thoughts and reactions. Never shall I forget that night, the first night in the camp, which has turned my life into one long night, seven times cursed and seven times sealed. Never shall I forget that smoke. Never shall I forget the faces of the children, whose bodies I saw turned into wreaths of smoke beneath a silent blue sky. 4. The question that is always asked in why do we learn what we do in school, with that question looming in many student’s mind, Why study the Holocaust, something that happened more than 50 years ago? What are the important lessons that you take away from the testimonies of people who were witnesses, allies, targets, and rebels during this time. English and social studies lend themselves too conveniently to reading and writing with historical fiction and writing with document based questioning. In fact, half of my ELA curriculum is driven by the humanities. But what about science? Yes, there is reading and writing involved in science classes but how do we bring to the forefront the interconnectedness between these two disciplines? This past month I wanted to bring science into my 8th grade English class through an investigative journalism unit. Students read and wrote an investigative journalism feature article with a science focus. Guiding Question: How do the choices we make impact the world? First, I immersed my students in science based nonfiction texts. We examined author’s purpose, text structure, and craft moves like Ethos, Pathos, and Logos. The Society for Environmental Journalism recognizes and awards the top written journalism about the planet and I utilized their nominations and recognitions as mentor texts for my students. I wanted my students to live like journalists. Students wrote down possible topics of interest and choose two or three to research more about. Students began gathering the 5 Ws about these topics: Who, What, Where, When, and Why? After a few days of research student selected one topic to commit to. Before we did any writing, I required students dig deeper in their research and compile an annotated bibliography with four or five sources to help them write their feature piece. The idea being, all good writing is based on solid research. After students wrote their annotated bibliography they started their own articles. Paying close attention to the lead or lede, the author’s point of view, voice, and blending the qualities of narrative and argumentative writing. Our class became a writing workshop and the articles that my students created were informative, engaging, and inspiring. Topics addressed endangered animals, depression, obesity, pollution entwined with personal stories and connections. I created an eFlipbook of their writing using FlipsnackEDU to share their work. Because FlipsnackEDU is a closed sight, I cannot share the ebook with you, but below I have included a pdf version of one class’s writing. I have also listed resources used to develop the unit. Gallager, Kelly (2015) In the Best Interest of Students. Maine: Stenhouse Publishers. This summer my 8th grade students read Warrior’s Don’t Cry, Melba Pattillo Beals’ memoir detailing the emotional and physical abuse she endured as one of the nine students to integrate Central High School in Little Rock, AK in 1957. 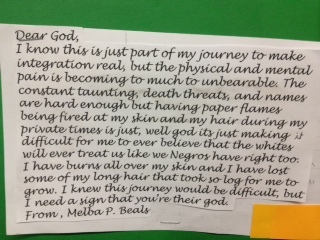 This personal story, from a teenager’s perspective, offers insight into Beals’ struggles between being a “normal” teenager and a freedom fighter for racial integration. I had read about a writing and art activity in an article written by Linda Christensen for the Zinn Education Project called Literary Postcards. Christensen’s article details the variety of activities she employed in her classroom to help her students’ read deeply and understand the historical impact Beals’ experience had on American history. I had my students complete Literary Postcards and I was in awe of their writing and drawing abilities. 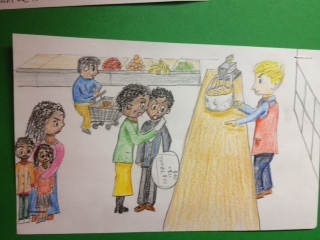 Using oversized note cards, students drew pictures of significant scenes from the book on one side of the “postcard.” Then, on the other side of the post card the student wrote a poem, letter, diary entry or monologue from one character to another explaining what happened in that moment. The written part is not meant to retell the scene, but to understand the scene from an personal perspective. 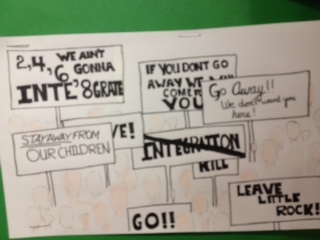 Below are some of the postcards my students created.